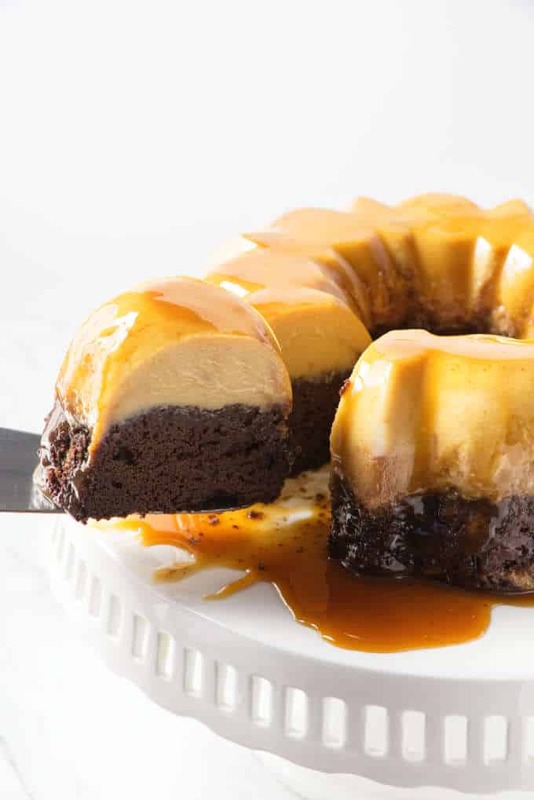 Chocoflan cake is two desserts in one. A creamy flan on top of a rich chocolate cake. It is a match made in heaven. The cake is a fudgy chocolate butter cake and the flan is a cream cheese flan (also called Flan Napolitano). Oh chocoflan, you stole my heart! I knew we were meant to be the moment I laid eyes on you. We bonded quickly and it felt so natural being with you. The time we spent together was short but sweet. Just when I thought it could never end, I looked down and you were gone. Be still my heart! Oh, but I won’t fret. I saved your love letter and I know how to find you. (um.. make you). I have a gut feeling I will see you again. I fell in love with this cake and you will too. What is a Chocoflan cake? 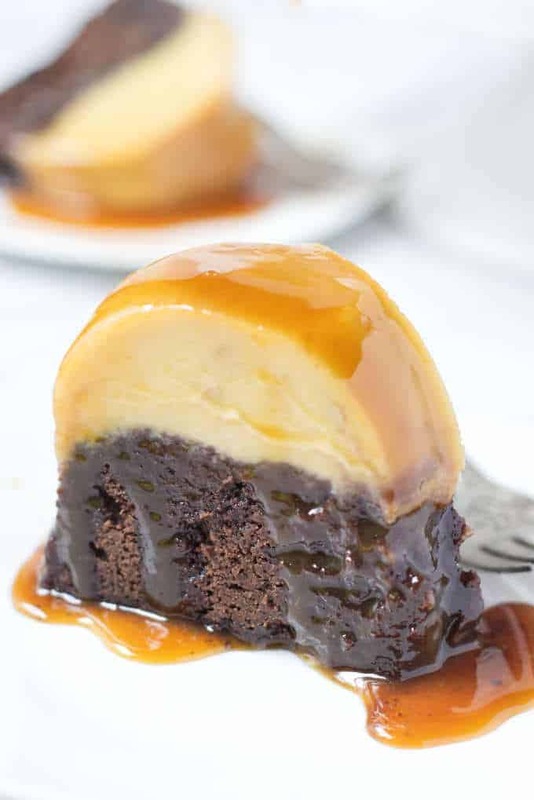 A Chocoflan cake is a Mexican dessert that is a combination of a chocolate cake and a cream cheese flan. The two layers get baked at the same time…. in the same pan. Chocoflan cake is also called an impossible cake but not because it is difficult to make. The title for “impossible cake” came about because the two layers perform a seemingly impossible stunt by switching places while the cake bakes. It is almost magical. The cake is rich, chocolatey, fudgy, and decadent. 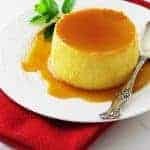 The flan is creamy, smooth, and luscious. 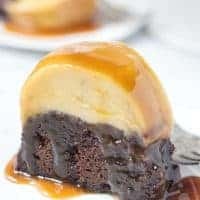 The Chocoflan cake comes out of the oven in perfectly defined layers then a delicious, gooey caramel sauce gets drizzled on top. When I say drizzle, I really mean you should pour a whole bunch of that yummy stuff on top. It is out of this world delicious! You are going to lick up every crumb. How do you make Chocoflan cake? There are a few steps involved in making this Chocoflan cake but they are not difficult. First, make the cake batter. The chocolate cake in this recipe is a rich, fudgy, butter cake. The batter is thick and creamy (not thin and pourable like this Intense Chocolate Cake). The cake is quite easy to make. First, add some boiling water to some unsweetened cocoa powder and set the mixture aside to cool down while you gather the rest of your ingredients. You will need to cream the butter and sugar, then add the eggs and vanilla extract. Next, beat in the chocolate mixture and then stir in the dry ingredients. Voilà! Chocolate cake batter! Done! Now, you’re going to spread a bit of caramel sauce (or cajeta sauce if you really want this cake to be authentic), into the bottom of a large bundt pan. 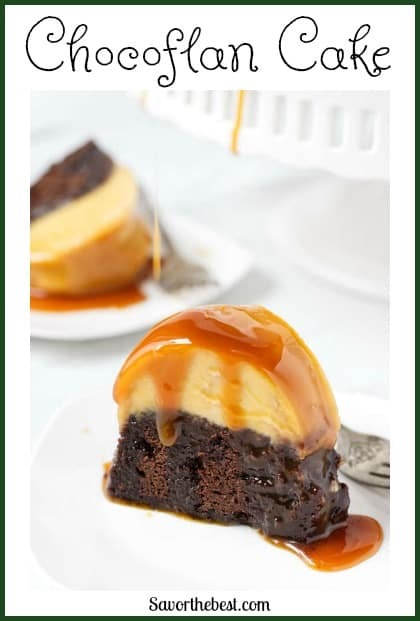 Pour that chocolate cake batter right on top of the caramel sauce (or cajeta). What is cajeta? Cajeta is delicious caramel sauce made with goats milk. It is nutty and malty and delicious. 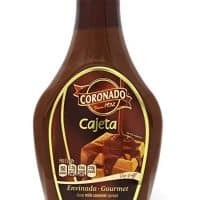 Very similar to regular caramel sauce and yet different. If you find some, try it, you might like it more than caramel sauce. Next, make the cream cheese flan. 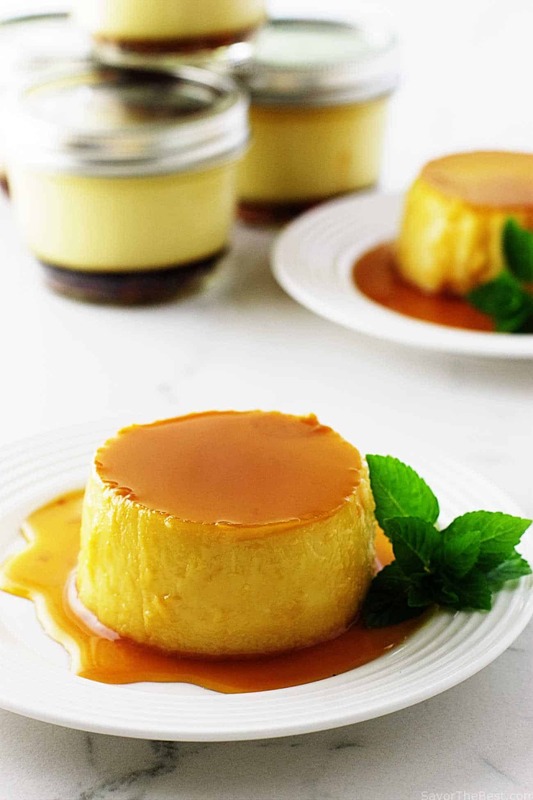 We used our recipe for Flan Napolitano in this Chocoflan recipe. It is the best cream cheese flan ever! There are only six ingredients. All you have to do is blend them together. We used a blender but you can use a food processor or even stir it by hand. Pour the flan mixture over the cake batter and cover the bundt pan with a piece of aluminum foil. It helps to spray the bottom of the aluminum foil with a bit of nonstick spray because the cake will come all the way to the top of the pan and could stick to the foil. Set the bundt pan in a larger pan and pour boiling water inside the larger pan. The flan layer of the Chocoflan cake will be creamier and smoother if you make a water bath. Make sure you don’t get any water inside the Chocoflan. And be careful not to spill the hot water when you transfer it to the oven. If you’re worried about sloshing and spilling the water then you can put the two pans in the oven before you pour the water in the larger pan. This cake will take 70 to 80 minutes to bake. While it is baking, the two layers will slowly switch places. The chocolate cake will end up on the top and the cream cheese flan will sink to the bottom. After you let the cake cool down, place a serving plate on top of the bundt pan and then flip the pan and plate over so the cake is on top. 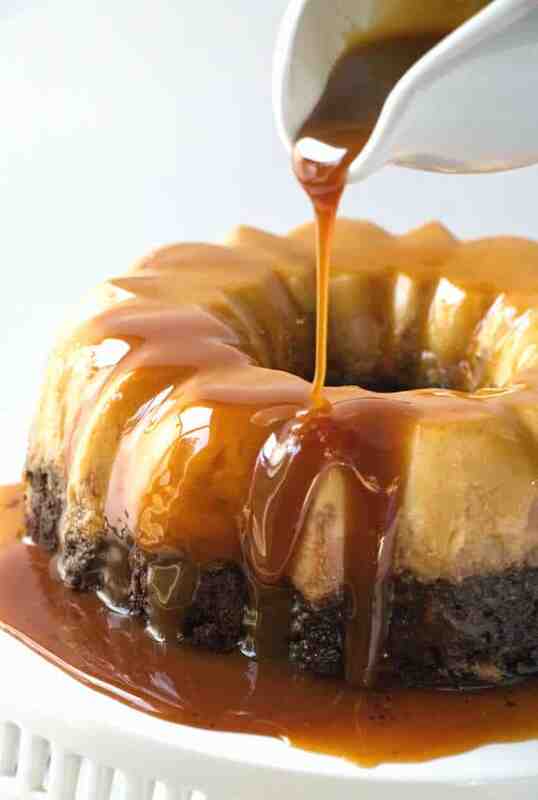 Lift the bund pan off of the cake and drizzle some caramel sauce or cajeta on top. You will need to use a large 12-cup bundt pan for this cake. Even a 10-cup pan will be too small for this recipe. If you are not sure if your pan is the right size then you can fill it with water. Measure the water as you fill it. You need to fill it with 12 cups of water. It’s ok if the water goes to the very top. If it holds even a cup less then the cake will flow over the pan when it bakes. Watch our video and see how easy it is to make this chocoflan cake. 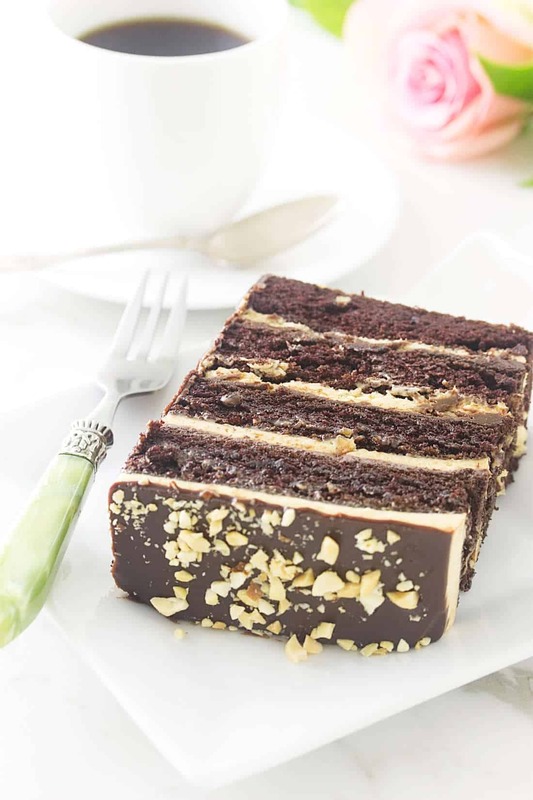 Chocoflan cake is a fudgy chocolate cake layered with a creamy, smooth caramel flan. The two layers get baked together in the same pan and magically switch places while baking. The cake is a fudgy chocolate butter cake and the flan is a cream cheese flan (also called Flan Napolitano). Preheat the oven to 350°F. Spray a 12-cup bundt pan with non-stick spray or grease it with butter. Pour about 1/3 cup of the caramel sauce (or Cajeta) in the bottom of the pan then reserve the rest of the caramel sauce for the garnish. Combine the boiling water and cocoa powder in a small bowl. Whisk until smooth then set aside to cool to room temperature. Place the butter and sugar in a large mixing bowl. Beat with an electric mixer until creamy. Add the eggs one at a time and beat well after adding each egg. Beat in the vanilla extract. Add the cooled cocoa mixture and beat well. Scrape down the sides of the bowl and mix it again. Combine the flour, baking powder, and salt in a medium bowl. Whisk them together then add it to the batter. Mix on low speed or by hand until the flour is slightly blended in then increase the speed of the mixer. Continue to mix until the flour is well combined. Make sure to scrape the mixing bowl a couple of times so no flour is left behind. Pour the cake batter into the prepared bundt pan (right on top of the caramel). Set the pan aside while you make the flan. Place the cream cheese, sweetened condensed milk, evaporated milk, sugar, egg yolks, and vanilla extract in a blender or food processor. Blend until the ingredients are smooth. (for best results strain the mixture through a wire strainer). Pour the flan mixture on top of the chocolate cake batter then set the bundt cake pan inside a larger pan. We used a 10 inch square cake pan. 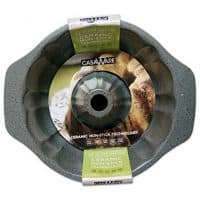 Pour hot water into the baking dish but make sure you don’t get any water inside the cake. Cover the chocoflan cake lightly with a piece of oiled tin foil (see notes). 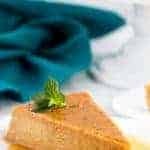 Now that you have the chocoflan in a water bath, place it in the preheated oven and bake for 1 hour to 1 hour 10 minutes. Do a toothpick test and take the cake out of the oven when the toothpick comes out clean. 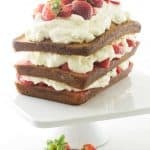 Let the cake cool down at room temperature for an hour then let it sit in the fridge for 2 to 3 hours or until ready to serve. 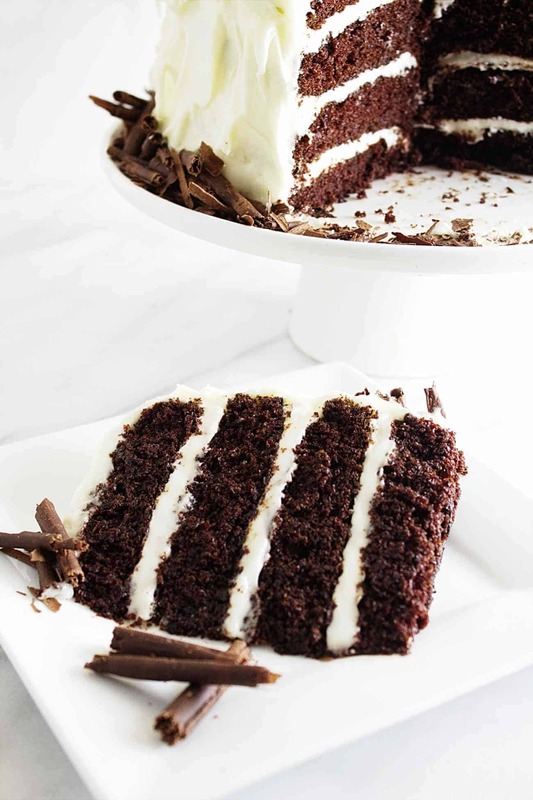 To serve, use a knife to loosen the edges of the cake from the bundt pan and invert the cake onto a serving plate. 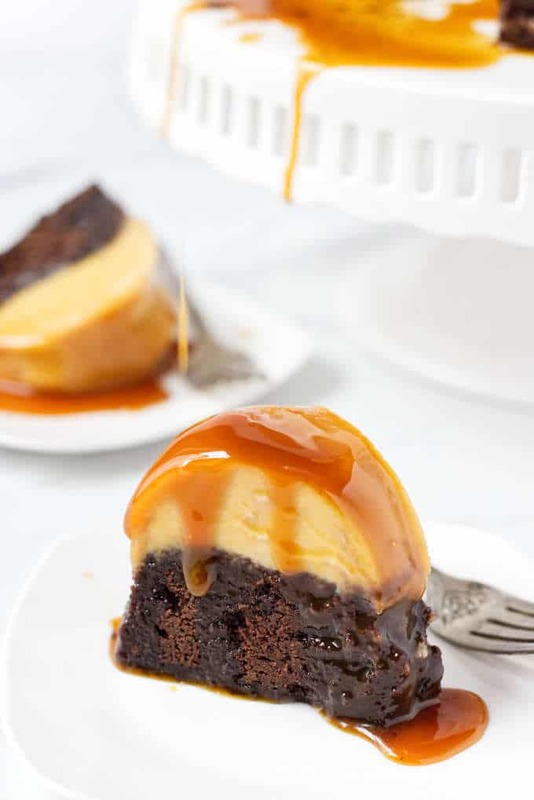 Drizzle caramel sauce (or cajeta sauce) on top of the cake. Pour the cake batter in the bottom of the bundt pan then pour the flan on top of the cake batter. When the cake is finished baking, The chocolate cake will be on top and the flan will be on bottom. After you invert the cake, the flan will be on top again. Cover the bundt pan with a sheet of tin foil before placing it in the oven to bake. Spray the underside of the tin foil with non-stick spray to prevent the cake from sticking to the foil. You will need to use a large 12-cup bundt pan for this cake. Even a 10-cup pan will be too small for this recipe. If you are not sure if your bundt pan is big enough then just fill the pan up with 12 cups of water. If it holds 12 cups of water to the very top, the pan is large enough. Cajeta is a Mexican caramel sauce made with goats milk, you can substitue regular caramel sauce. Looks amazing. Can’t wait to try.